Melissa Gates spoke at Stanford for a SWIB event (RYAN JAE/The Stanford Daily). 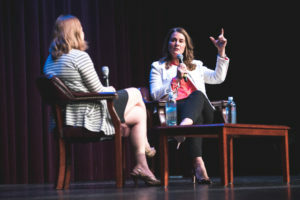 Melinda Gates spoke at Stanford for a SWIB event (RYAN JAE/The Stanford Daily). 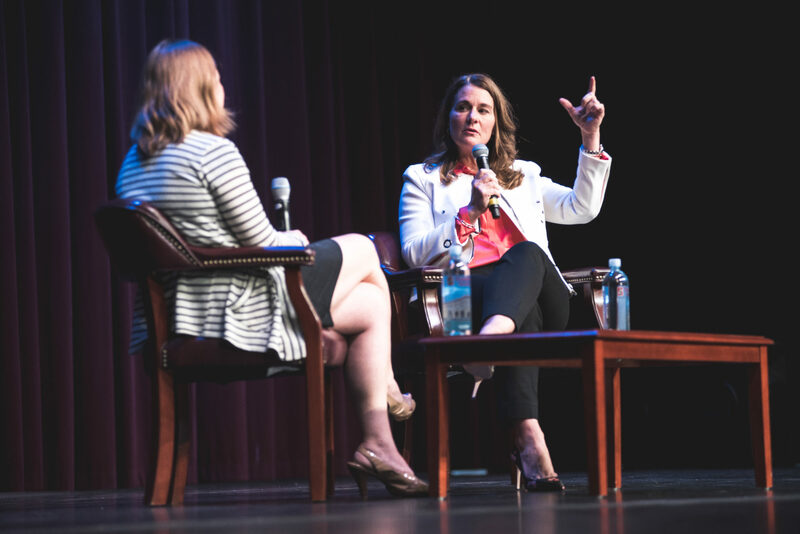 On Thursday afternoon, Melinda Gates — business executive and co-chair of the Bill & Melinda Gates Foundation — spoke to an audience of students, alumni and prospective freshman about leadership, philanthropy and the challenges of being a woman in the tech sector. Gates was on campus for a fireside chat sponsored by Stanford Women in Business (SWIB) as part of SWIB’s spring executive leadership series. Gates began the chat by discussing her path to studying computer science in college and the challenges she faced as a woman in a male-dominated field. Gates first began to code when she was a student at an all-girls parochial high school, where a teacher took a particular interest in her and encouraged her to experiment in the field. Her parents supported her interest, eventually investing in a family computer. Gates’ father, who worked as an aerospace engineer on the Apollo missions, also inspired her by proactively seeking out women mathematicians to place on his teams. Gates said that oftentimes being the only woman in a lecture hall or computer science project group was daunting, but the most important thing was to maintain confidence in her abilities. Drawing on those experiences, she advised audience members to find partners who are willing to be vulnerable and admit that they also find the material difficult. She also pointed out that such collaboration made her realize her leadership potential. Throughout her talk, Gates emphasized the importance of surrounding yourself with challenging people who will be brutally honest with you and yet still support you. She discovered the importance of heeding honest advice while being recruited by IBM right after college; her hiring manager told her that she would have more upward mobility at Microsoft. Gates started at Microsoft in 1987 and worked there for nine years. “We were changing the world and we knew we were changing the world,” Gates said of her early days at Microsoft. Gates said that while Microsoft was an intense place to work, she loved the challenge. However, she said there were times when the culture of the workforce felt antithetical to her personality. According to Gates, a key moment for her career came when she decided to “try on her own style” at Microsoft. The more she did this, she said, the more she attracted sought-after developers and engineers to work for her. Gates said she had to be careful not to come home and discuss work-related things, especially once she began managing teams, but went on to state her belief that the partner you choose in life is the most important decision you will ever make. During their engagement, Bill and Melinda decided that their vast earnings from Microsoft would go back to society, and after the death of Bill’s mother, they started the Bill & Melinda Gates Foundation. The foundation, built upon the conviction that all lives have equal value, works to provide health care and education in developing countries. Gates stated that she and her husband operated as absolute equals, but that regardless, she still faced bias and implicit sexism from the beginning of her work with the foundation. People oftentimes assumed that the foundation was simply Bill’s foundation or underestimated her knowledge of world issues during negotiations. In response, Bill and Melinda made a concerted effort to overcome this inherent bias by emphasizing Melinda’s equal partnership and say in the foundation and by hiring strong women leaders for important positions. Asked if she had any advice for audience members, Gates emphasized the importance of cultivating a network of supportive friends, pointing to her good friend Sheryl Sandberg as an example. Friends like Sandberg open doors and give support in times of need, she said. Gates’ talk concluded with four takeaways: be confident, be authentic, surround yourself with people you want to emulate and have resilience.